There seems to be a battle between Tamasha fans and haters, while some are overly disappointed after watching the movie, others can’t stop gushing about it. But there’s one thing which requires no debate and that is, how amazing Deepika Padukone looks in the movie. Not just once or twice, Deepika gave us some serious wardrobe goals from the first time she came on the screen and till the very end. Here are some of Deepika’s looks from the movie which will definitely get you to shop this weekend. 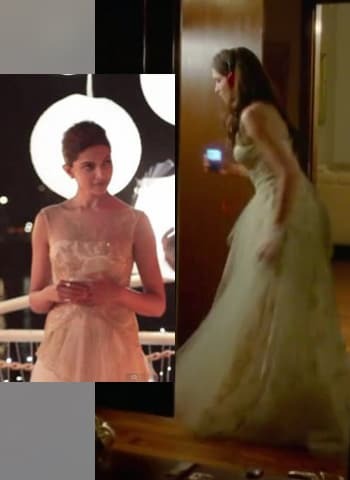 Remember how everyone totally got hooked on Deepika’s first look, when Tamasha’s trailer came out? There’s no second say in how incredibly chic Deepika looked in the simple blue dress with a tan belt; and that quirky red lips shirt which made a statement of its own. Deepika looked every bit an angel in this white lace dress with a black jacket paired with a floral tiara. Why not try this one on your next date? Trust us; it'll leave him totally swooning. Sneakers seem to be Deepika’s favourite. She was spotted in super snazzy sneakers several times in the movie. This green dress with a tan belt, fringe brown bag and white sneakers can become ‘the’ look for your next vacay. We are loving this gorgeous retro meets casual look. The white knotted shirt and printed denims are awesome but the multi-coloured scarf/bandanna stole the show. With a blue sweater over a peter pan collared shirt and a sling bag, Deepika has taken preppy chic to another level. Aren't you tempted to wear this look to your office already? Deepika has given us something for the winters as well. That floral dress, with a purple jacket and knee-length boots is just perfect for a party on a chilly winter night. Deepika certainly knows how to carry herself with grace, and this look is another example. We are sure this sheer yoke gold maxi dress got everyone screaming “I want this”.